Check out Tobi's Regina Tasseled Hoop Earrings Best of both worlds in the Gold Regina Tasseled Hoop Earrings. Can't decide between hoops or drop earrings? Now you don't have to! Trendy metal tassels drop just behind a gorgeous hoop earring, perfect for everyday wear & special occasions. Take these cute, chic earrings with you everywhere! Best of both worlds in the Gold Regina Tasseled Hoop Earrings. Can't decide between hoops or drop earrings? Now you don't have to! Trendy metal tassels drop just behind a gorgeous hoop earring, perfect for everyday wear & special occasions. Take these cute, chic earrings with you everywhere! Best of both worlds in the Silver Regina Tasseled Hoop Earrings. 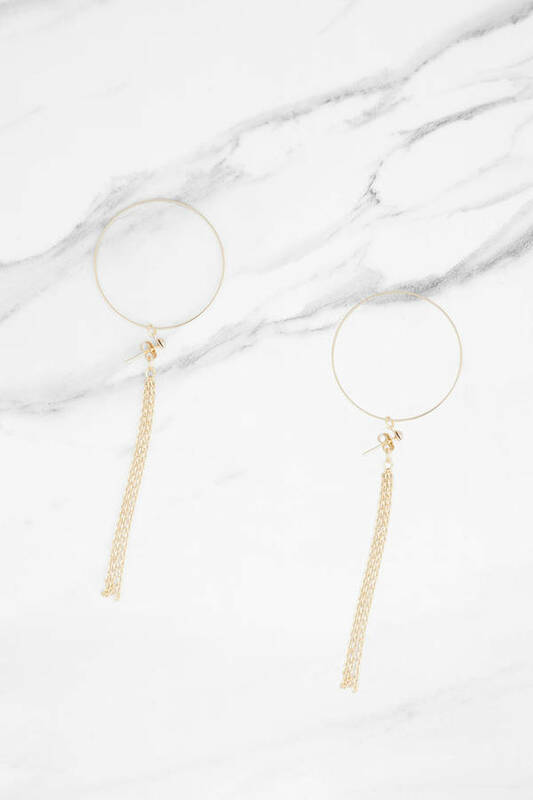 Can't decide between hoops or drop earrings? Now you don't have to! Trendy metal tassels drop just behind a gorgeous hoop earring, perfect for everyday wear & special occasions. Take these cute, chic earrings with you everywhere!